What’s better than taking in the crisp mountain air when you’re hiking the great outdoors? The scenery, wildlife, and panoramic views make the trek unforgettable. But whether you’re doing a day hike up the Santa Monica Mountains, hiking the Grand Canyon for a view of a lifetime, or scaling the massive Rocky Mountains, you’ll need the right hiking gear list to keep you safe and in-the-know. Why not bring along some cool headphones for the trip. In this post, you’ll learn the top essentials to put on your hiking gear list to get you ready for the trip. Here are the must-pack items for the ideal mountain hike. 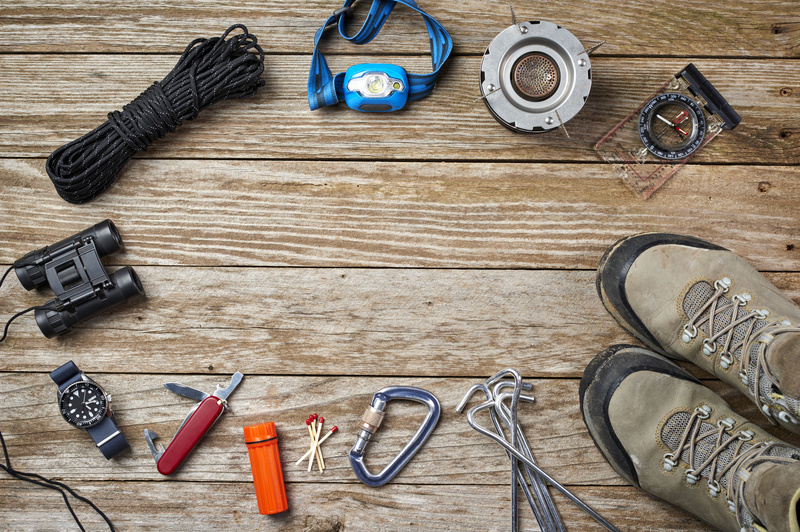 The first items you’ll need on your hiking checklist are the right navigational tools. Staying on the right track is critical when hiking through trails, backcountry and up mountain peaks. It’s important to bring along a variety of navigational tools. One navigational device won’t be enough in the event one malfunctions or gets smashed. You don’t want to be stranded in the wilderness if your GPS signal fails or if your cell phone is out of range. The first thing you’ll need is a map of the topography. A topographic map will provide additional details of the geography that a typical area map won’t have. Some of these details include roads, borders, lakes, boundaries, and paths. Another map you’ll need is a map of the local area. Make sure to carefully review the map before you set off on your mountain journey. You’ll want to know what natural obstacles might be in your path. Knowing the terrain will help you get prepared for the trip in advance. Another important item you’ll need for your hike is a compass. A compass will keep you on the right path. And when you following map directions that say to go east, it will keep you from heading west. Make sure to test out your compass before the trek and make sure it works properly. It’s a good idea to have a backup compass in case it stops working or breaks. Carry along a plastic case to insert your navigational tools. A plastic case will shield your maps and compass from inclement weather. You’ll need gear to protect you from nature’s elements. The sun’s ultraviolet rays can get strong even when it’s not that sunny out. So you’ll need protection from the UV rays scorching your skin or eyes. The first thing to pack is sunblock lotion. Choose a lotion with high SPF protection to avoid getting burned. Take along two pairs of sunglasses for your hike. Make sure they have good UV protection. An extra pair is always a good idea in case one pair breaks. Your eyes will thank you. And don’t forget a hat which also will shield you from the sun. Other nature-protective gear to put on your hiking gear list include bug repellent and bear spray. Pack it in your suitcase or buy it when you get there. When you’re wriggling through the great wilderness and trekking up challenging mountains, you’ll need to wear the right clothing on your back. Packing the right clothes will keep you warm (or cool) and comfortable on your hike. Many hikers prefer layering clothing items. Wear a sweater on top of a heavy shirt and a t-shirt underneath. This way you can remove layered clothing when you get too hot. If it’s a warm day and won’t get cool into the evening, put a sweater in your backpack and take it out later when the temperature drops. And don’t forget a good pair of hiking boots. If you’re doing an easy hike, you might be able to get away with hiking shoes and not need heavy-duty hiking boots. What would a hike be without a good backpack? It’s the best place to put all your items for the trek. Many backpacks contain pockets for your cell phone and other critical items. And some backpacks have a place to put your reservoir so you stay hydrated. Backpacks are one of the most essential items to have on your hiking gear list. Learn more about different types of backpacks. Any experienced hiker knows the importance of staying hydrated on a hike. That’s why you need an abundant supply of water. Consider getting a hydration reservoir, also known as a hydration bladder. It will enable you to keep your hands free so you can hike with greater ease. You can get hydration packs, or get a backpack that is hydration reservoir-compatible. Most backpack manufacturers offer them. What’s great about them is you won’t have to dig through your backpack every time you get thirsty. Hydration reservoirs come in one liter, two liters or three liters. You can get a backpack with a single tube to drink from or one with several tubes that attach to the backpack’s shoulder straps. If you’re planning on buying a new backpack, consider the size hydration bladder you want before you make your purchase. Don’t consider a hike without a first aid kit. It will fix you up if you get scraped by thorns or get an insect bite during your climb. While you may never need to use it, a first aid kit is a must-pack item on your hiking gear list. There are basic things you’ll need on your hiking trip, especially when you’re hiking for more than an afternoon. On your hike, you’ll need snacks to fuel your energy. Make sure and eat foods or snacks that are rich in vitamins and nutrients. Take along protein-rich foods with unsaturated fats. You can grab them for a quick snack, so you don’t have to delay your hike to find or prepare lunch. Some healthy foods include nuts, oats, and dried fruits. Salmon that’s rich in Omega-3 provides another good choice. And stores sell them in packages that are great for hikers. Now you know eight of the most essential items to put on your hiking gear list. Write them down. Pack them. Then check off the list and you’re ready to hike nature’s great wilderness. Looking for cheap t-shirts, clothing, and sunglasses for your hiking trip? Try a thrift shop. Or explore our blog to read more content about news, sports, movies, music, games and more.